Rock Wall Miniatures There are 11 Reviews. Walls are one of the most common miniature terrain or scenery accessory for tabletop games. Rock wall scenery doubly so. This set includes a solid rock wall miniature as well as a crumbly rock wall miniature. An excellent source of cover for your armies or troops. Rock walls, and visual cue walls of this size and scale, are perfect for in-game cover mechanics. 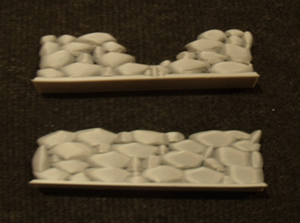 The solid rock wall miniature can provide a 50% cover bonus in most tabletop games while the crumbly rock wall miniature can provide 25-50% coverage. Not only are rock wall miniatures useful for tabletop combat mechanics, they are also useful for impromptu missile/projectile weapons especially for giants who enjoy juggling. Each Rock Wall Miniature is made individually WITHOUT using a manufacturing mold.